but with the case of a heuer 510.513 (strap fitment to case) ? So , what do you reckon...? Genuine or fake ? Last edited by flame; 22-11-2009 at 15:32. To my knowledge, a complete put-together. 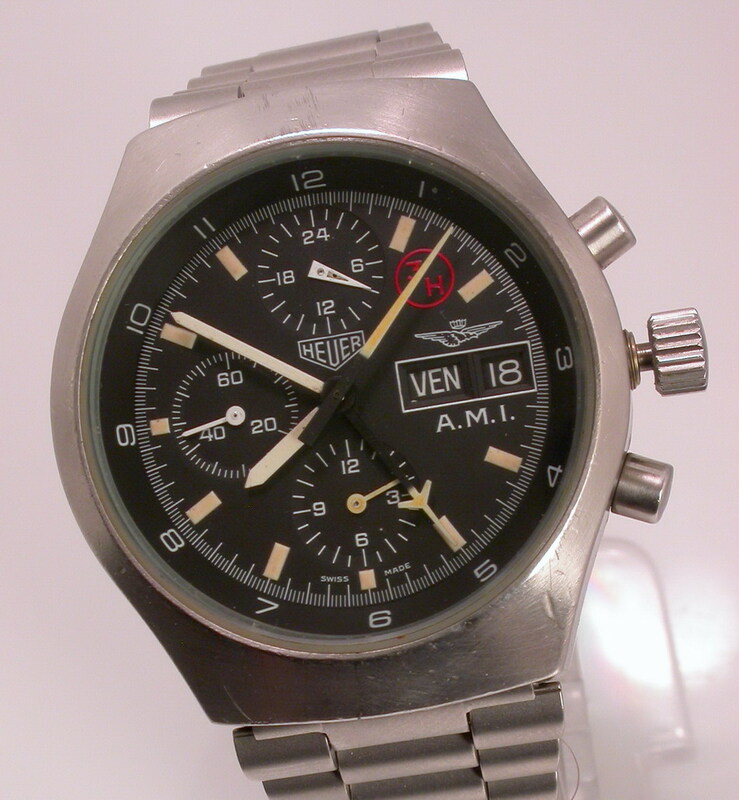 Lemania did do a 5100 AMI, as well as Heuer, but only in the Heuer AMI case, which is more akin to the Sinn 157 (or the Bund Tenglers and Arctos', same difference). Any caseback piccies. to see whether a decent job has been done on any engraving, or whether it is hilariously bad, as many sych offerings are? I recall something like this being offered on EBay Italy a while back, at a pretty price too, is it back on the market? The (3H) looks a little odd too. I thought it 'looked good' , however , I couldn't pin it down as a genuine model and could only come up wth AMI version you mention - and I wasn't 100% happy with the dial / case combi - as I've tried to describe above. Looks like a Lemania Cortina with AMI credentials. Real or put together? 3H looks in a bad place? That's a put together watch. The dial and caseback are genuine and probably come from the real watch's parts bin, but the hands come from an Orfina Porsche Design, and were mounted incorrectly anyway (the sweep second and 24 hour dial hands are mixed up). My advice: stay away from this thing! This particular watch has been kicking around on ebay Italy for a while. (There's another one in a different case which also appears from time to time). I did some homework on it some time back and came to the same conclusion as above. The one on p.583 on Konrad Knirim's book on German military timepieces is in a Tengler-type case (as all A.M.I. issue watches of this type should be), has no 3H on the dial, has LMC and a crest above the date and simply the word "Automatic" beneath. The caseback is engraved 6645-12-194-6642, the 12 indicating Germany but as it was for a Nato partner the back is also engraved A.M.I. for Aeronautica Militaire Italiana. P.S. Al' - can we move this thread to NSN 6645 for reference, once it has gone cold? The original's case is, as expected, the Arctos / Tengler, bearing more similarity with the latter, with the 1-12 bezel scale identical to the Tengler, and the same white with lume centre hands. Sorry, I didn't really post a conclusion on this. Thanks Dave, AL , M (& all who contributed to this thread)...I had my suspicions that all was not quite right - but not enough knowledge to back it up - so I'm glad I flagged it for further debate here - I've certainly learnt something and hopefully someone else will now stumble on this thread and be saved from actually buying it !!! BTW - Does anyone ever flag these items to ebay ?